As the world races towards catastrophe, a crowd of Mayfair socialites parties its way to oblivion. At its centre is David, who idles away his sober moments researching a futile book until the beautiful Helen decides to save him, shattering his marriage and learning too late the depth of both David’s indolence and his wife’s undeclared love. But with finances about to crash and humanity on the brink of global conflict, the drink keeps flowing and the revellers dance on. Both an insightful, witty critique of a generation and a profound dissection of the depths of human emotion. 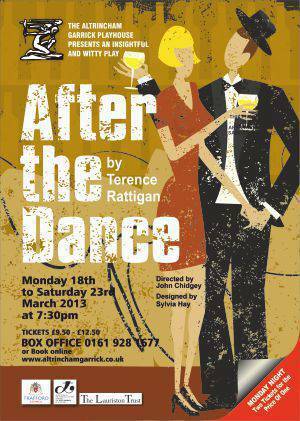 "Married love revealed too late"
Terence Rattigan's golden oldie After the Dance first performed in 1939 and not well-known, proves popular with the audience and I must congratulate the Garrick on presenting it. This play has the professional stamp of experienced director, John Chidgey who brings out the best in a 15 strong cast. As the Second World War approaches, David Scott-Fowler and his wife Joan, forget their troubles in a round of imbibing and partying in their luxury Mayfair apartment, beautifully illustrated by Sylvia Hay's set. Most of the drinking is done by David who blots out his hard work as a historical writer and the forthcoming war in a haze of the hard stuff which seriously affects his health. Then along comes his young cousin Peter with Helen, his 20-year-old fiancee. As soon as she meets David, Helen sets her cap at him, determined to stop him boozing and then marry him. Of course, he is already married but both he and Joan are too inhibited to reveal their mutual love. Yet talented actors, Peter Birch and Ros Greenwood, make the audience aware of their true feelings, whilst behaving in a shallow and flippant way towards each other. Ros gives an unforgettable performance in the play's most moving moment. It is when she realises her husband is swapping her for a younger model and temporarily discards her perpetual jauntiness to give a heart-warming display of grief. We have a sterling performance by Kate Millington as the over-zealous Helen nonchalantly setting out to break a marriage that has survived for 12 years. She tells Joan of her relationship with David without a flicker of conscience or care for her feelings and boasts about how well she has taken the news. Her soulful ex-partner, Peter (Chris Mawson) makes his views clear as much by facial expression as language. The play owes a lot to Mike Shaw who, not only plays John, David's well oiled but ultimately wise friend but also heads the Garrick's wardrobe team. He interprets the former with light-hearted humour and delivers amusing one-liners. In the latter capacity he comes up with beautiful costumes of the thirties. I especially like the long dress worn by Joan at her final party. Laura Chandler, also exquisitely turned out, adds colour as the party pooping Julia Browne. I'm glad the Garrick has revived this play. In the second half, a shocking event takes you aback but, unfashionable by today's standards, there is a comparatively if not happy then neat ending. After the Dance is generally known as one of the ?lost? Rattigan plays ? although it was televised in 1994 Rattigan himself did not include the play in his own collected works and the original West-End run closed after only 60 performances, due in no small part to the outbreak of war.? It is set just before the outbreak of the Second World War as the ?bright young things? in London attempt to blot out the upcoming horrors with a hedonistic run into drinks, drugs and parties.? However in this case the protagonists are no longer bright or young! It portrays beautifully the very British habit of repressing emotion, or indeed anything serious, as being ?just too boring?. The open set was a stunning portrayal of the opulent Mayfair flat of David and Joan Scott-Fowler.? There was great attention to details in costumes and props (although I was not sure that the telephone was quite authentic) and they reflected the era beautifully. Lighting was good but I was disappointed with the sound from the ?piano?.? It came from the wrong place and was not bright and crisp but muted and obviously recorded. There was without doubt some excellent acting and characterisations well maintained throughout the production with some lovely ?clipped? speech so typical of the period.? Diction was superb from all the major principals and we clearly heard every word. ?The cast all looked extremely comfortable both with their characters and costumes and on the excellent set ? the fourth wall became just that ? we were looking into the flat - great acting and direction. Like all Rattigan plays it is fairly ?uncomfortable? and there was no applause by the fairly large audience at the end of scenes which I found almost more disturbing than the play ? although the applause at the end was certainly most appreciative. Thank-you for a most interesting and entertaining evening and for the revival of this almost forgotten work.